A resource for scholars and others interested in media literacy. This document was originally developed by graduate students enrolled in BTMM 589, "Theory and Practice of Media Literacy Education" which was taught by Professor Renee Hobbs in the Fall of 2006 at Temple University's School of Communication and Theater. Students enrolled in the course in the Fall of 2007 continue to develop, modify and expand the site, contributing their own understanding of the course readings and critical analysis. Media literacy has developed from two theoretical views: inoculation theory and cultural studies theory. These two views originate from different assumptions about subject matter, how audience is impacted, and how the subject matter is taught (Christ & Potter, 1998). One camp of scholars see the agenda of media literacy as empowering individuals to explore and to control the effects of media on themselves. Another camp sees the agenda of media literacy as transforming society through activist work where individuals are motivated to change institutions to make them more democratic (Christ & Potter, 1998). "Teachers need to consider where they are comfortable on the spectrum of activism…we need to consider what we want action to mean…Teachers might also make a distinction between how they are personally involved and how they might more safely channel their students’ activities” (Anderson, quoted in Schwarz, p. 236). Renee: I wonder what "safely" means in this context. Safe for whom? One of the most wonderful and maddening professors I had as an undergraduate was an English teacher who urged us to engage politically with the world. As in intellectual leadership to urge students to step into activist work or is it essentially coercive? There is a split within media literacy organizations which further illustrate this conflict between empowerment and activism. [The Alliance for a Media Literate America] (AMLA) situates critical thinking, analysis and creative production at the fore of its mission. Although the [Action Coalition for Media Education] [](ACME), supports a similar mission, they remain driven by an underlying critique of commercial media and corporate involvement in media literacy. Through their work and project materials, ACME further investigates how the media is shaped by advertising, censorship and communication regulations. Critics fear that media literacy education can become a substitute for social and political action. One concept that deserves further exploration is the question of what constitutes action. Among media reform groups, there is often an implicit (and sometimes explicit)hierarchy of what constitutes the most important issues on the reform agenda and what forms of action are more significant. Drawing upon the work of scholarship on service learning, there is a need for research that examines how students interpret educational experiences which invite them to take various forms of political and social action. Scholars conceptualize and debate over media literacy differently according to a variety of reference points. Christ and Potter (1998) offer a summary of the different approaches to defining the media literacy field and its boundaries. “Media literacy” can be regarded as a public policy issue; a critical cultural issue; a set of pedagogical tools for school teachers; suggestions for parents; a McLuhanesque speculation; or a topic of scholarly inquiry from a physiological, cognitive or anthropological standpoint. Media literacy has also been defined as the study of textual interpretation; of context and ideology; or of the audience. The terms “media” and “literacy” acquire yet additional connotations when considered separately. 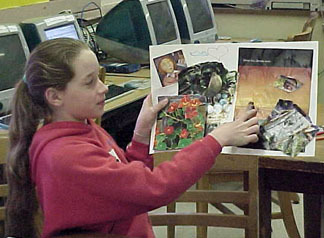 Studies with a focus on a specific “medium” may favor oral and written language; still and moving images; computers; television; or multimedia. “Literacy”, on the other hand, can be regarded as a skill; as an accumulation of knowledge; or as a perspective on the world (Christ and Potter, 1998). Media literacy practioners often disagree on media literacy's role within the school curriculum. For example, some practitioners of media literacy in higher education aim to train students in a specific skill they will need to acquire a job. This approach to media literacy is challenged by practioners who believe this focus is too narrow. The latter approach focuses on the importance of educating students in a broad manner to participate in a complex society (Christ & Potter, 1998). It is with this premise in mind that Tyner identifies 4 categories to which media education currently falls under in The Tale of the Elephant: Media Education in the United States. Tyner gives both the traditional problems with each stance and shares the changes that educators are making to improve curriculum. Protectionism This view states that educators act as the ‘gatekeepers’ and ‘arbitrators’ of taste. Tyner points out that because protectionist are always on the defense to popular culture, they approach change through a ‘knee-jerk political response to educational reform’ that reaps ‘disjointed funding and confused teaching practices in the United States.’ As media becomes more and more entertaining and pleasurable, and as students grow in their skepticism to educators being the vessels of truth, this conservative view leaves little room for effective teaching of what quality culture is or is not. Technology Education Tyner notes that much of what is considered media education currently in America falls in this category and is favored for its perpetuation of job readiness through student acquisition of technology skills. Problems arise in its computer-centered approach which discounts other needed media skills, its avoidance of technology’s influence on content, as well as its partnerships with communications corporations whose motivations are typically self-serving. Democracy Education The development of citizenship skills is critical for educators of this stance. The problem is the lack of good examples in the daily operations of American schools. It’s hard to teach citizenship when the very institution they teach in contradicts what they say. Furthermore, as classrooms become more culturally diverse the lack of diversity in textbooks reflects the challenge of teaching critical analysis of media representation. Despite theses problems and other barriers identified, there is hope. Tyner states, ‘they are beginning to see past their blinkers in order to forge common goals and objectives, long-range planning and practical ideas for implanting media education in the United States.’ For the sake of the future of media education, I hope she is right. Whether media literacy should be taught as its own specialist subject or integrated throughout the curriculum of science, social studies, history, the arts, and literature depends on a school's context of educational policy, funding, administration, and teachers. Media literacy can be integrated into classrooms most easily by teachers discussing the media texts they use in the classroom. Hobbs (1998) gives the example of a ninth-grade science teacher who had students visually analyze two different documentaries about the Exxon-Valdez oil spill disaster--one produced by Jacques cousteau and the other by Exxon. Buckingham (2003) argues for media education across the curriculum in all subjects. Media education can work with a wide range of subject areas and address learning objectives, as "many media education activities involve competencies such as literacy and numeracy, as well as skills in areas such as technology, problem-solving and research" (Buckingham, 2003, p. 89). Buckingham (2003) explains how media education can be studied in history, science, foreign languages, and music (pp. 90-91). On the other hand, media literacy as a separate subject usually happens as a "pragmatic option" yet it can be successful. For instance, the University of Maryland offers a popular Media Literacy course to undergraduates as part of their core courses. Integrating media literacy across the curriculum may enhance each subject, however the downfall is that teachers may be untrained in media literacy and incoherently include key media literacy concepts. Teaching media literacy as a separate course would provide a coherent coverage of media analysis and production, but the course may be marginalized as a "soft option" that is seen as less rigorous than traditional subjects (Buckingham, 2003). As Hobbs (1998) points out in the "Great Debates" article, some teachers worry that the texts of popular culture are not rich enough, not substantial enough, to warrant significant levels of attention in the classroom. English teachers, at both the high school and college levels, often use texts that speak about the human condition in ways that reflect the deeply humanistic orientation of their field. This idea is often dismissed by those approaching the field from the perspective of cultural studies. Some, like John Fiske, claim that the texts of mass media and popular culture are just as rich and nuanced as classic works of literature, but that they reflect different values than those found in the literary canon. Others, like Robert Scholes, acknowledge that the texts of mass media and popular culture may often be more simplistic than literary texts, but that the reading process can be made more complex in responding to these texts. While most educators agree that the inclusion of mass media and popular culture connects to students' lived experience and increased perceived relevance, some media literacy educators prefer to focus on those classic works of film and visual media that have "stood the test of time." A rift in the field exists between those that believe media literacy efforts should not accept any corporate sponsorship or funding from media corporations (Heins & Cho, 2003), and those that believe that accepting funding from media organizations is an opportunity to advance the field and carry out projects that might otherwise go unfunded. For instance, The Alliance for a Media Literate America (AMLA) accepts funds from a variety of sources including media corporations, but the AMLA includes several restrictions in its operational policies, such as not being fully dependent on corporate funders, not allowing them to vote on issues related to AMLA, and not accepting direction or policy from the corporate interests (Alliance For a Media Literate America, 2005). Conversely, others believe that accepting funding for media literacy initiatives from media corporations is like sleeping with the enemy. Citizens for Media Literacy, for example, does not accept any funding from media corporations because they believe it is a conflict of interest and they stand a philosophical ground against Big Media (Heins & Cho, 2003). Thus, the issue of accepting funding from media corporations has created divisions between those in the media literacy movement. While the ultimate goals of media literacy are being debated, so are the approaches. This is not only debated in the k-12 setting, but also in higher education. The question remains - is it more helpful to bring in a person representing the current hierarchical media system or is it more beneficial to bring in a representative that will explain new advancements in technology? Advancements that will progress the future of media – challenge the current the media systems (Christ and Potter, 1998)? Which option is a media educator to choose? Being as that two levels( K-12 and higher education) intertwine (both levels are encouraging/creating practitioners), following and implementing the current media systems would ultimately defeat the premise behind media literacy. This leads to Blanchard and Christ’s idea that there are two different types of learning experiences – media workshops and laboratories. The former is based on the current systems of management and content. While the latter challenges all of the current ideals and make recommendations for the future (Christ and Potter, 1998). The latter is favored by Blanchard and Christ as these laboratories will most likely encourage students who want to become practitioners, to improve these media industry outlets (Christ and Potter, 1998). The role of the teacher is questioned by many media literacy scholars. Some scholars advocate that media literacy can contribute to a nonhierarchical classroom environment. The teacher student relationship becomes based on "reflection and dialogue" (Christ & Potter, 1998). Other scholars insist this method is contradictory; a teacher cannot be the bearer of truth and an "equal partner in dialogue"(Christ & Potter, 1998, p. 11). Effective media literacy programs create an environment for students to find questions in need of answering. A non-traditional method of teaching is needed to foster this kind learning where student-teacher interaction creates a democratic learning environment. The teacher becomes an equal in the inquiry of the media, contrary to his or her traditional hierarchical role as the all-knowing mentor. Many see this as an opportunity for students to learn how to learn independently of the traditional system but others see it as jeopardizing the teacher’s authority and professionalism (Christ & Potter, 1998). Among the many aspects of the on-going discussion, scholars are grappling with the issue of whether or not to include the teaching of the aesthetics and the language of media production in Media Literacy curricula. Those in favor claim that that learning the techniques of production leads to an increased awareness of the construction of media messages and their underlying meanings, which in turn could potentially foster the much desired attitude of skepticism. In opposition, others argue that this inclusion could, instead of developing a critical attitude, lead to the students being 'seduced' into mindless imitation of such media constructions. Still others encourage training students in media production for the purpose of instilling in them a proactive attitude and will to 'better' the 'status quo' of the industry (Christ & Potter, 1998). Besides the purpose and content of curriculum, scholars have also found varying approaches to the structure of Media Literacy programs. In some, media studies is a distinct discipline; in others media education is an element within a curriculum or across the entire curriculum; and for others, it is incorporated as a topic within an intergrated, interdisciplinary curriculum. Each has their objectives and governing ideologies, but is ultimately determined by 'resources and will' (Christ & Potter, 1998). Hobbs and Frost through a study in 1995, demonstrated that Media Literacy was most effective when integrated across disciplines. Project Look Sharp also advocates (through its various publications) the incorporating of media education into existing curricula as opposed to having it as a distinct course, claiming that this approach is not just more effective, but also less burdensome on the teachers (Heins & Cho, 2003). Instead of defining media literacy with a certain set of skill or knowledge, it can be looked at in terms of the key concepts of production, language, representation and audience. This is advantageous because “it does not specify particular objects of study (a ‘canon’ of prescribed texts, for example); and this enables media education to remain responsive to students’ interests and enthusiasms” (Buckingham, 2003, p. 53). The production of media texts is important to study in order to make connections between media, better know the industry structure, technologies and regulations and how media texts are accessed and made. The language of media looks at meanings, conventions and codes found in texts as well as recognizing genres, decisions of language choices and how technology can change its meaning. When students investigate bias, stereotyping, authenticity and realism in texts they are learning how influences manipulate representations of reality in the media. Who the media address, how and why they address them, and how receivers of media make sense and use it is all explored under the key concept of audience. Students interactively address these concepts through exercises in which they research and produce media, log and reflect on diaries of their own media use, and critically compare and analyze media texts (Buckingham, 2003). This allows students to draw on their own experiences with media, keeping them interested and utilizing texts that are relevant to the child’s social experiences. This can help lessen the dilemma of the student’s social background affecting the teacher’s ability to assess and create curricula. Renee: I'm not sure what is meant by the 'dilemma of the student's background.' It is important to talk about how social class affects media discourse and taste.It is also important to not only look critically at mainstream texts, but to think about how "alternative" media function. Since institutional support for media literacy in K-12 programs translates into funding, assessment and outcomes are central elements of a politicized debate over media literacy assessment standards and methods (Christ and Potter, 1998). There are arguments on whether assessment should focus on knowledge, skills, behavior, attitudes, affect, values or other concepts. Christ and Potter (1998) point to the two (out of 23) most relevant to media literacy standards developed by the National Communication Association as the closest approximation to "certified" national guidelines, which measure an understanding of media's impact and media use. How “media literate” a child is does not depend specifically on their age, grade level, or level of literacy in general, but depends more on the child’s social background and experience with media. The child’s level of media literacy should not be accessed by a set of vocabulary or notions of media theory at certain ages. Children are empowered by questioning media texts and their reality or meaning. These critical reflections of media are related to a socializing function in which children can demonstrate their critical competence. Therefore, their social background is important in observing their level of literacy. This “suggests that making sense of the media is not simply a matter of what goes on inside children’s heads: it is an interpersonal phenomenon, in which social interests and identities are unavoidably at stake” (Buckingham, 2003, p. 48). This can create a great deal of difficulty for the media literacy instructor who may have students from a variety of different social backgrounds. The more diverse the student body, the more difficulty the teacher will probably have in not only assessing the student but creating curricula to benefit everyone. When addressing the application of media literacy in the higher education classroom setting, many media education programs in the United States look at the purpose of their curriculum as a way to prepare students to work in media industry after they graduate. They focus only on their task to make their pupils technically efficient and competent in writing for media. But this often overlooks the need to make their students literate in reading media texts critically and not just producing them. The practitioner oriented approach can be problematic if you have professional newscasters speak to students about how to create the “status quo” news broadcast unless you can counter it by reviewing the presentation through a critical lens afterwards (Christ & Potter, 1998). Many media literacy educators oppose the "protectionist" approach to media literacy, which focuses on preventing children from consuming "objectionable" media messages. These educators feel that by labeling certain media messages as "bad" and others as "good", there is a strong possibility of alienating students. Bob McCannon, head of the New Mexico Media Literacy Project, insists that protectionist media literacy helps students to analyze and criticize mass media. Critics assert that this philosophy merely teaches students to pass value judgments on popular media instead of employing critical analysis skills (The Free Expression Policy Project). One critic of the protectionist method is Goodman, who advocates that after school programs "move beyond models of prevention and protection" (Goodman, 2003, p. 104) to the learner-centered, youth empowerment model. The former, instead of encouraging decision-making, ownership, and actively engaging students in community problem-solving, often treats students as "passive recipients of knowledge" (p. 104), focusing more on the problems that need fixing, and failing to initiate the involvement that is required to tackle these issues. Media literacy is especially important to students from disadvantaged backgrounds as a means of empowerment over their environment. Many students from low-income families also have poor vocabularies and writing skills. Other forms of media that they can identify with and are literate in like music, television and film, allow them to express themselves where writing would not. “As producers, authors, and artists fluent in multuple literacies, inner-city youth can frame their own place in society” (Goodman, 2003, p. 31). Goodman (2003) through his work with the youth at the Educational Video Center, has demonstrated the power of both the 'process' and the 'product' of the students' work in procuring both social and political capital. The development of vital relationships with community leaders, the building of social networks, the creation of work that serves as leverage for disseminating information and stimulating action in the community, are a few reflections of how his "media production students find a unity of purpose in their learning as students, their work as artists, and their engagement as citizens" (p.107). Buckingham (2003) makes a firm stance on the Protectionism-Empowerment continuum, strongly advocating for a shift in the curricular paradigm towards goals of 'preparation'. From this same perspective, he acknowledges the importance of harnessing the 'participatory potential' of the newer technologies for the development of students' creativity through conscious incoporation of media production in the classrooms; one of the benefits of which is the "enabling [of] their voices to be heard" (p.14). Although he vocalizes his support for the much-debated practical aspects of media literacy, he seems cautious in awarding it the status of a potential tool in the hands of youth for garnering social capital. He dismisses the positions of technological or 'media' determinists - Postman and Tapscott - who in viewing the relationship between childhood and media technologies, propound a more direct link between technology and social change. He claims that "technologies do not produce social changes irrespective of how they are used" (p. 23) but yet recognizes youth as 'cultural producers' given their increased access to and participation in new technologies. He is careful to discern "consumer sovereignty masquerading as... cultural rights" (p. 31) in the larger discourse of 'childrens' rights' and is hesitant to accept claims of children as 'independent social and political actors'. Yet in spite of Buckingham's insistent disunion between media production and social currency, he places media literacy in the larger social theory of literacies - a theory that implies that "acquiring literacy (in whatever form) makes possible social action" (p. 39). It seems that Buckingham recognizes the possible theoretical links between media literacy, media production and social action but is yet to be convinced of these practically playing out. Although he declares some of these claims 'exaggerated', it would be problematic to entirely dismiss the potential of media production as a catalyst to not only general literacy, possible cognitive and psychological change, but also social change. There has been much debate over the role of media corporations in the media literacy movement. Some scholars believe that media corporations should not be part of the media literacy movement, since their main goal is monetary profit, not an educated audience. Others believe that since media corporations provide access to mass audiences, it is beneficial to have media literacy experts working within these structures as well as outside of them. Some media corporations have created their own media literacy programs and/or offered corporate funding to media educators. Many media literacy experts view this as a conflict of interest. According to The Free Expression Policy Project: "The conflict over corporate sponsorship also highlights a philosophical rift between those who focus on analysis of media content and those who view the structure of the media industry as an equally important concern." One example of the controversy involves Channel One, which "had been widely criticized as a cynical and educationally dubious marketing scheme that sold a captive audience of schoolchildren to advertisers" (The Free Expression Policy Project, 2003). The school district of Billerica, Massachusetts took advantage of Channel One's offer to provide schools with media equipment in exchange for broadcasting 12 minutes of news and two minutes of advertising to students daily. The school district received much criticism for this decision, and in 1992 they hired Renee Hobbs to create a comprehensive program to train teachers to teach media literacy using Channel One. Hobbs later became a paid consultant to Channel One. Buckingham, D. (2003). Media Education: Literacy, Learning, and Contemporary Culture. Cambridge, U.K.: Polity Press. Christ, W. & Potter, W. (1998, Winter). Media literacy, media education, and the academy. Journal of Communication, 48(1), 5-15. Goodman, S. (2003). Teaching Youth Media: A Critical Guide to Literacy, Video Production & Social Change. New York, NY: Teachers College Press. Tyner, K. (1993). The Tale of the Elepahnt: Media Education in the United States. In C. Bazalgette, E. Bevort & J. Savino (Eds. ), New Directions: Media Education Worldwide. London: British Film Institute (pp. 170-176).